This post is sponsored by Kidde Worry-Free Alarms. Florida residents can enter to win 1 Kidde Worry-Free Smoke Alarm to comply with new state regulations for fire safety; enter at the bottom of this post. The state of Florida passed a new law (reference: Fire Safety Laws by State) Jan. 1, 2015 that says any newly installed or replacement smoke alarms must be powered by a sealed-in 10 year battery. That means if you are completing a minor level one alterations to your home or if you’re replacing an old battery-powered smoke alarm, that you need to install a sealed-battery alarm. Our home was built in the 80’s and only has 1 old-fashioned smoke alarm in the hallway. It still works and we will continue to replace the battery in that one six months when it chirps at us in the middle of the night. We have decided though to update our smoke alarms and add a few extra. Why? Do you know how many smoke alarms are recommended for your home? According to Kidde and the National Fire Protection Association (NFPA), you should have at least one smoke alarm on every floor of your home, one inside EACH bedroom, and one outside of sleeping areas. Now go look around your home, do you have enough?? We didn’t have enough and the one we had wasn’t powered by a sealed-in 10 year battery. On average, families only have 3 minutes from the time the smoke alarm sounds to get out of a burning home. THREE MINUTES!!! When you’re sound asleep and trying to wrangle little kids that’s not a long time. They recommend putting a smoke alarm in EVERY bedroom to help alert everyone quicker. This is especially important if anyone sleeps with the doors closed or if bedrooms are split/spread out in your home. A Kidde Worry-Free (affiliate link) Bedroom Smoke alarm runs about $30-35 and is powered by a long life lithium battery that will last for 10 years. They also have both a chirp and a voice alarm. The voice alarm is recommended for small children who may sleep through noises and chirps. I really wanted to be the one to install the smoke alarm so that I could see just how hard they are to install. The directions were very simple and gave you suggestions on where to place your new smoke alarm. While it is safest to place them on the ceiling in the center of the room, I decided to place it on the wall at one of the highest spots due to our constantly running ceiling fan. The only tools I needed were my ladder and a screw driver. I did grab a hammer and nail to help make the initial hole. 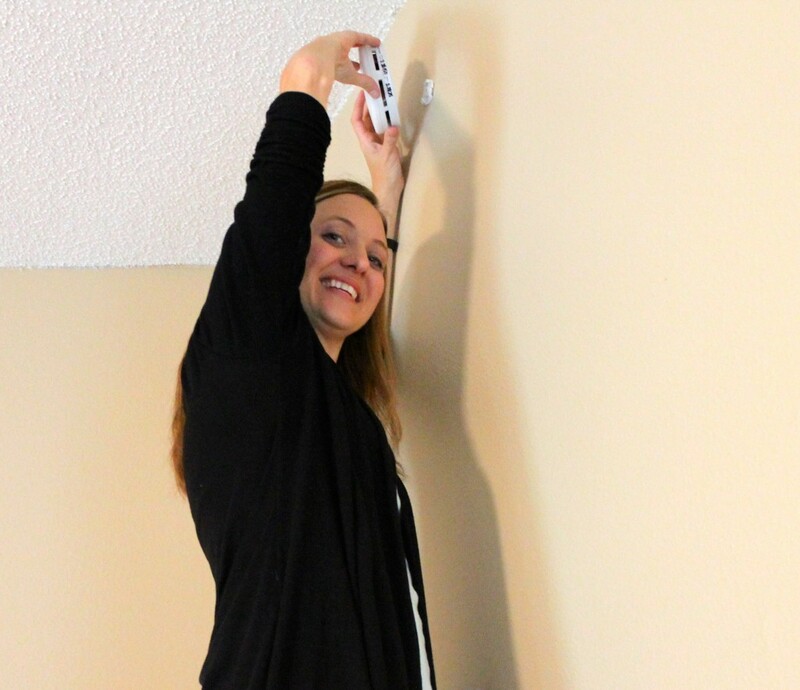 The mounting plate screws directly to the wall or ceiling with one large screw (included) and then the smoke alarm mounts on top of the plate. It took me less than 5 minutes and there were no wires or electrical work to do! Once the smoke alarm attaches to the mounting plate the power is turned on. With a press of the button you can test to make sure it’s working. Guess what? Kidde is going to give one of my readers from Florida a little help making their home a little bit safer for their family. 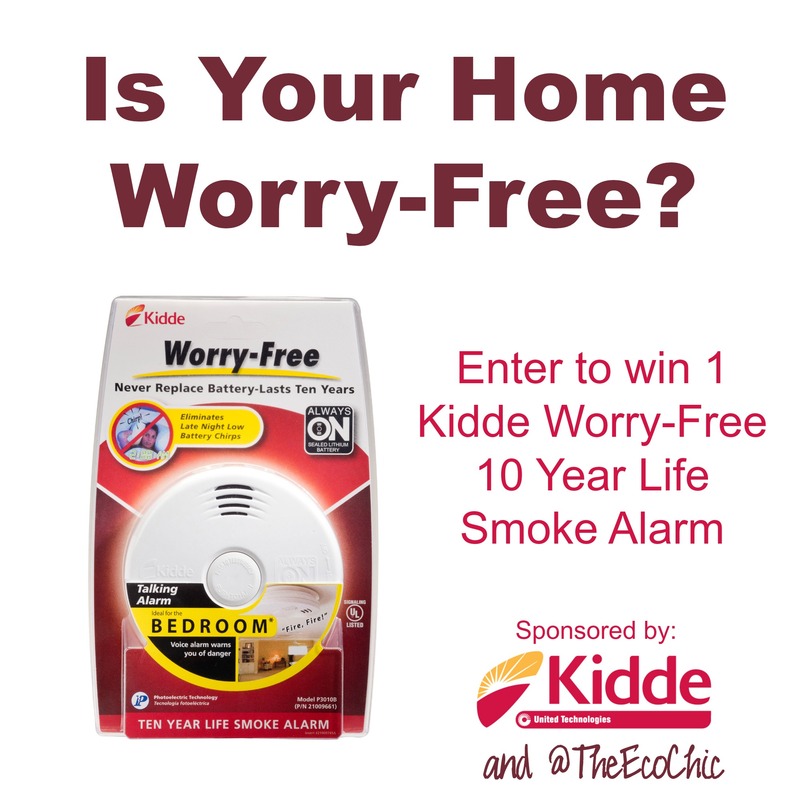 They are giving away one Kidde Worry-Free Bedroom smoke alarm (that complies with the new 2015 regulations). The only catch is that you have to live in the state of Florida! To enter complete the Rafflecopter form below. Disclosure: This post is sponsored by Kidde Safety and I was compensated to share this new law and giveaway with you. I also received a Kidde Smoke Alarm to install in our home. All opinions in this post are my own and/or supported by research I’ve linked above. thank you for sharing this! It’s amazing how much we don’t know. I love the worry free alarms for kids! we had an alarm one night, I guess it was just because of a battery going dead, but let me tell you, it was an instant awake for the adults. That thing is loud and since it got to all alarms, it did wake everyone up. The worst thing here is people using old or wire space heaters that can catch on fire. So, so many fires lately on the news. We have a couple of the heaters, but they don’t have exposed wires, and of course are new (and expensive, unlike the wire ones that are used to put out a ton of heat for little $) — so fingers crossed it won’t happen to us, but knowing that we have wired and battery powered alarms all wired together that will alert the whole house (even if something happens in the crawl space, yup, there’s one there, too)… I think the only thing that doesn’t have one is the garage. I hope we can put a stand alone one in there this spring, when it’s not in the negative temperatures all the time. Brr! Just commenting to say this is great and I hope they do something like this here, too. Wanted to say if anyone’s from other states, that if they don’t have enough alarms, they can contact their local fire departments or city halls and see if anyone gives them out. In bigger cities, often they do for people living in rental homes without them. They are inexpensive, but often people put it off in favor of things like food. not knowing that they can get them for free. I only have two in the entire house. Eeek. I met the folks from Kidde at Dad 2.0 in San Francisco. They are the real deal! Great products, great cause – family safety.